- what are the bankswitching possibilities? In which ways can the Z80 access more than 64K? - what are the screen modes/resolutions? How is the video ram organized and where in memory is it placed? - are there standard floppy drives and file systems existing? - are there emulators for the Enterprise available? Do they contain a monitor/debugger? You can switch any segment to any Z80 page. The page select ports are the B0H-B3H (in the DAVE chip), this select segments to page0-page3. Any segments can be a ROM or RAM. The top of FFH segment used by the EXOS (operating system) for system areas. The NICK chip (video chip) have great feauters. You can define the screen memory everywhere in the video RAM, you can define differentc screen modes to every pixel line! Easy work to bulid CPC type screens. The NICK can access 64K video RAM, from the Z80 this is the FCH-FFH segments. 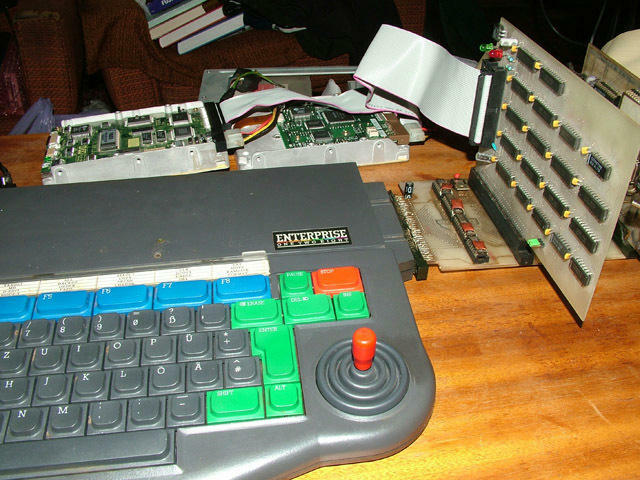 EXDOS the disk controller card, using standard floppy disk drives (40 or 80 tracks, 1 or 2 side: from 180K up to 720K), can use up to 4 drives. The disk controller use WD 1770/1772 controller chips. With some hw modiffications (developed by me )the EXDOS can use HD floppy drives (1.2/1.44Mb), using the standard PC compatible HD disks, or unnofficialy format up to 22 sectors/track on 1.44Mb disks. 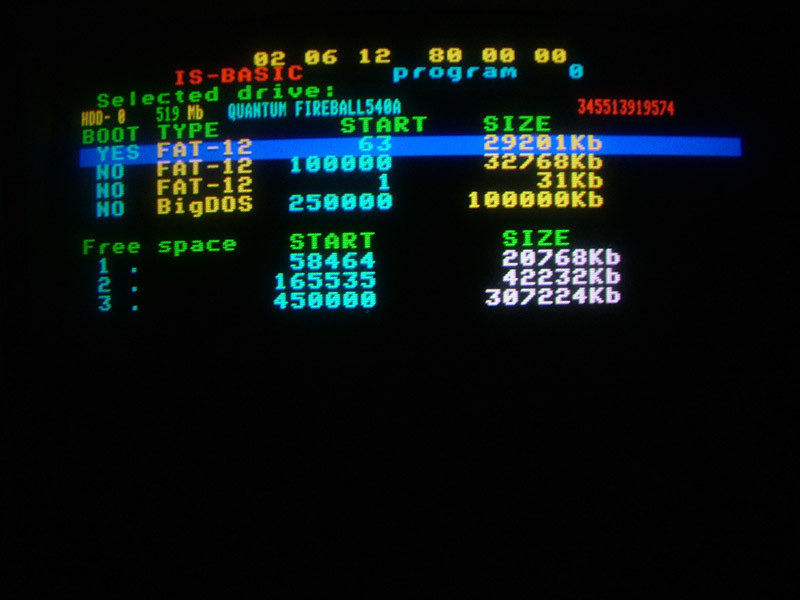 The EXDOS have built in RAMDISK support, the RAMDISK is use standard FAT12 filesystem. On Enterprise you have many points where can handle the disks. With EXOS calls, this is file level access, and with the EXDOS command calls, can use any EXDOS commands (this is standard DOS commands, CD, COPY, MOVE, REN, FORMAT, etc). With EXDOS calls can use DOS, CP/M like calls (File controll blocks and etc). With other EXDOS calls can read/write any sectors of any EXDOS logical drives. And the floppy handler part of the EXDOS have direct entry point, this is the DISKIO calls, with this the low level handler for floppy drives. thanx a lot for the information! I have already seen, that an EP port will be possible! And good to know, that the emulator has a debugger, too (ok, just a small one). PS: Because of the port I bought a EP64 some days ago. Is it possible to order a memory expansion and/or a disc drive somewhere? And good to know, that the emulator has a debugger, too (ok, just a small one). What OS are you using for the development? Currently I am using Windows XP. The reason why asked that is because my emulator (unreleased) works under Linux only (yet). It has a built-in debugger, disassembler, you can use breakpoints too. I think its debugger is slightly usable than the EP32's debugger (maybe I am just prejudiced , but at least it is bigger ). My emulator is in pre-alpha, there is no sound, but most of the programs are working on it. If you would like to try my emulator please let me know and I will revamp it because Im currently working on its new UI which is not working yet. This offer is stand for anybody else too who use Linux, of course. Ok, cool! I think it will take some weeks until I can start with the EP, but then I will try to instal Linux to test your emulator. If you would like to try my emulator please let me know and I will revamp it because Im currently working on its new UI which is not working yet. I'd like to try it as "anybody else who use Linux"
Ok. I'm going to make a simple website for my emulator and I will inform you if there is any progress. I can quote Depeche Mode: "It's just a question of time"
I know But the source is not really "user-friendly" (yet) and I dont want to release such an ugly thing. I bought a EP64 some days ago. Is it possible to order a memory expansion and/or a disc drive somewhere? When you want it? Now or in the future? The prototype card have two IDE channels, I think the series will be with one for HDDs and one CF socket. Initialisation program, this allocate memory from the EXOS, detect controller cards, hard disks, an read the partition informations, make table with all partitions datas. EXDOS Extension interface: at the system startup, the EXDOS ask every ROM extension programs, who have disks, which needed handled by DOS. If any ROM have disks, report to the EXDOS, have many logical disks, and address of the device driver program. Not needed to work with files, directories, FATs, etc! The EXDOS will do these functions! Only needed this functions: read/write sectors, and format disk. The EXDOS (written in 1985!) can handle logical disks up to 32MB, with FAT-12. Without any modifications! In the future, after I fully disassembled the EXDOS, I want to recompile with FAT16 and 32 bit sector addressing support. SymbOS already supports FAT12, FAT16 and FAT32, so it should run fine with your controller and big harddiscs. But the maximum is 128GB, as currently I am not supporting the atapi protocol. LBA is limited to 128GB (2 ^ 28 * 512). But hey, who cares!